Oddly, my OSX system preferences went weird yesterday (see image on the right). 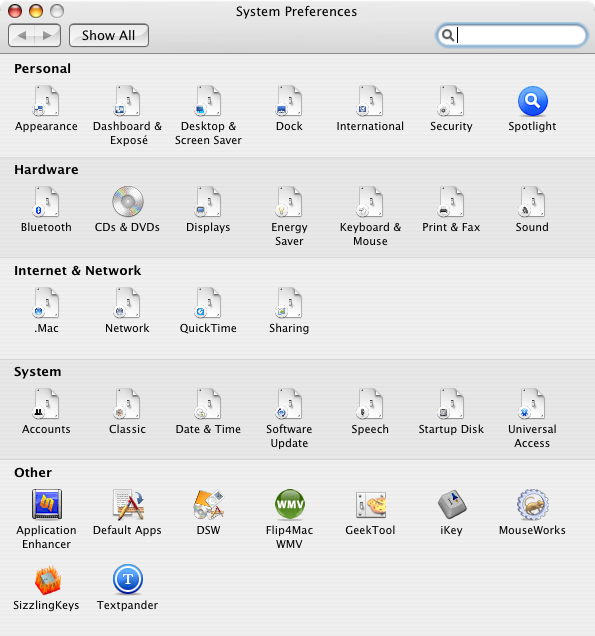 Each system preference (well, most of the Apple-provided ones, anyway) shows as a "Preferences switch" icon, with the icons for the individual panes in the lower-left. Of course, this used to show with the small left-hand icon bits as the whole image for each preference pane. BTW, I'm using Tiger (OS X 10.4.5 PPC) on a G4 Powerbook. I am an avid lifehacker reader and saw one of your posts on there. I am wondering if you would give me an invite to be a user on there since I know of no one personally to invite me? my email: thefnjester at yahoo dot com.